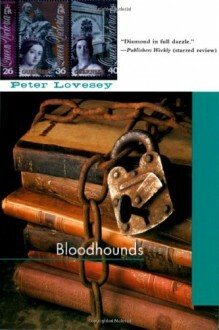 “Peter Lovesey tosses off a real brain-banger in Bloodhounds, the fourth book in a challenging series. . . . I am mad for these pyrotechnic teasers, and this one had my head spinning.”—Marilyn Stasio, The New York Times Book Review “A perfect blend of psychology and technique.”—Boston Review “In a witty takeoff on the always titillating ‘locked room’ mystery, Lovesey’s wise but beleaguered hero Peter Diamond confronts a homicide case as perplexing as any he’s faced.”—Booklist “Lovesey gives us his laconic Bath policeman Peter Diamond in full dazzle. . . . With this especially effective conclusion, Lovesey demonstrates that his embrace of crime fiction reaches from John Dickson Carr to Andrew Vachss as he skillfully pays homage to the old style whodunit in this thoroughly modern mystery.”—Publishers Weekly “Lovesey, always something of a Golden Age writer out of his time, provides some ingenius variations on the old ‘locked room’ mystery formula, while gleefully lecturing the reader on genre lore.”—Kirkus Reviews A rare stamp and a corpse are discovered in Bath within hours of each other. As he investigates, Inspector Peter Diamond discovers that both the person who found the stamp and the victim belong to the Bloodhounds, an elite group of mystery lovers, who now urge Diamond to bring the murderer to justice. But there’s a hitch: the body lies inside a padlocked houseboat and the only key is in the pocket of a man with an airtight alibi. Peter Lovesey is the author of 24 highly praised mysteries and has been awarded the CWA Gold and Silver Dagger, as well as the Cartier Diamond Dagger for lifetime achievement. He has also been the recipient of an Anthony Award and numerous other US honors. He lives in West Sussex, England.